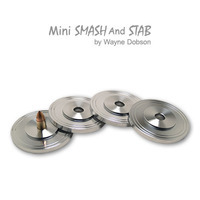 Today, when you order "Mini Smash and Stab by Wayne Dobson", you'll instantly be emailed a Penguin Magic gift certificate. You can spend it on anything you like at Penguin, just like cash. Just complete your order as normal, and within seconds you'll get an email with your gift certificate. Wayne Dobson presents Mini Smash and Stab - Four highly polished aluminum discs one which houses a copper bullet. It uses the same method as the original "Smash and Stab" effect but now fits into your pocket and it looks a 'million dollars'. The original "Smash and Stab" is an effect Wayne conceived in 2001 and it became a phenomenal worldwide success with both magicians and mentalists. It has been featured many time son TV by various star performers. The four discs are laid out and covered with cups. The magician mixes the discs around while the spectator is turned around. 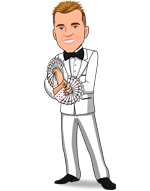 Then the magician turns around and allows the spectator to mix up the discs also. With the discs now mixed up, the magician asks the spectator to select a disc. That disc is pulled towards the spectator and left alone. One by One, the magician smashes the cups on the disc while fearing for smashing the disc with the bullet. The last one set aside by the spectator is revealed to be the disc with the copper bullet.